Brexit ferry contract | Notes from the U.K.
I’m cheating a bit here. Dusseldorf does exist, but a British Airways plane left London bound for Dusseldorf and didn’t find it. Somehow or other the pilot had been given paperwork taking him to Edinburgh. No one knew they had a problem until they landed. The pilot got on the intercom and welcomed the passengers to Edinburgh and the plane erupted. Someone asked the passengers to raise their hands if they wanted to go to Dusseldorf. They all did. They weren’t asked to raise their hands if they wanted to go to the toilet, which was good because by the time they got the plane refeuled and turned around–and found the pilot a good therapist–the toilets were all blocked. The passengers (and I’m assuming the crew, although I don’t really know that) did get to Dusseldorf, but they were five hours and twenty minutes behind schedule. This all has something to do with British Airways using a German company to run the plane under something called a wet lease, which I gather involves someone drinking large amounts of alcohol before circulating the flight plans. Ikea either was or still is selling a world map that doesn’t include New Zealand. This happens to New Zealand a lot, apparently. To pick another example at semi-random, a Smithsonian Museum world population map also forgot it. This happens often enough that the government website includes a New Zealandless map as a joke. In an effort to be helpful, comedian John Oliver circulated a drawing of the country so that people could download it, print it, and stick it on maps wherever they believe it goes. If you plan to do this, put in the Pacific Ocean–that’s the large expanse of blue that isn’t the Atlantic–somewhere to the right of Australia and down a bit. Don’t worry about getting it wrong. If it’s on the map at all, you’re ahead of the professionals. Ikea has apologized and said it will phase out the map, after which it will phase New Zealand in by adding it one island at a time. Irrelevant photo, since these do exist. Or did. 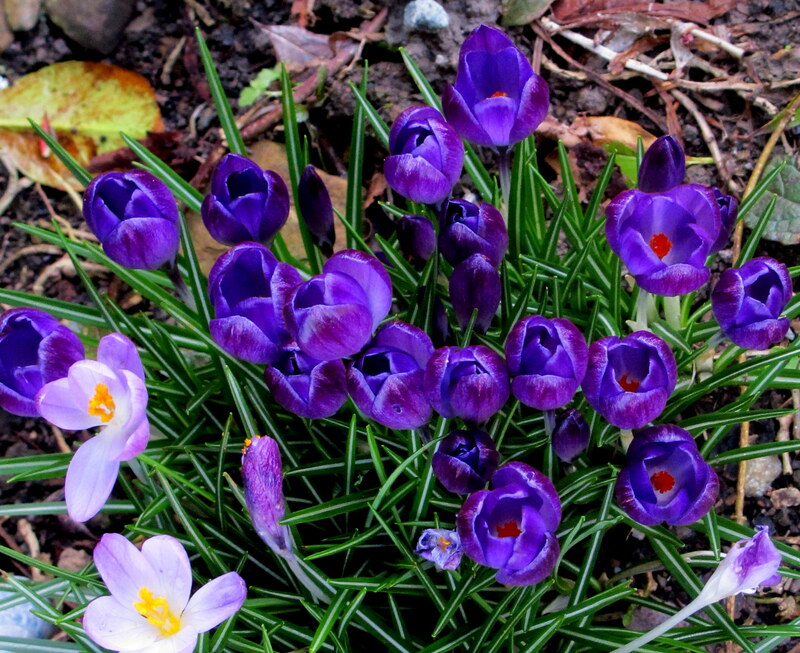 Crocuses blooming in February. Lord Google doesn’t translate corporate speak, but I’m reasonably sure phase out means We’ll get rid of this damn map as soon as we’ve sold the last copies. You don’t expect us to lose money voluntarily, do you? Ikea plans to build its first New Zealand store soon. Which will really put the country on the map. Sorry, I had to say that. The British government has been, in a distracted sort of way, preparing for a no-deal Brexit and looking for ways to add to the chaos it’s created so efficiently, so some time ago it awarded a £13.8 million ferry contract to a startup company that had no ships, no background in shipping, and no written guarantee of financial backing. In case you haven’t kept up with the British or Eurpoean news for the past two years, Brexit is Britain exiting the European Union. By the time you read this, something may well have happened. No one has any idea what, though. Every day the news just gets weirder. Cross your fingers that someone will save us from ourselves. The government later withdrew the ferry contract, saying it was okay because it hadn’t spent any public money on the deal. However (it didn’t mention), it had paid £800,000 to consultants to, um, consult on the project. In fairness they also consulted on two other projects for that money. Maybe the government got a three-for-two deal, making the ferry project a freebie. Supermarkets do it all the time. Generally with stuff that spoils before you get around to eating it. Then the government agreed to an out-of-court settlement that left it owing the Eurotunnel company £33 million because the bidding process on the ferry contract was opaque and the Eurotunnel company wasn’t invited to bid even though it has actually run a ferry service and can identify the English Channel on a map. Hint: It’s well to the right of Australia and up a long way. If that phrase didn’t provide you with an appropriate challenge, I can murkify the language a bit more for you, but basically what they’re saying–and this will surely be news to most teachers–is that if a book’s too hard the kid will sink and if it’s too easy the kid won’tbe challenged. Because that’s a difficult concept for teachers to get their heads around, and because you can’t make money without a highly polished veneer of science, the company has found a way to measure the difficulty of books statistically and has informed the world (probably by accident, but I don’t really know) that John Steinbeck’s The Grapes of Wrath is only a marginally more difficult read than the Roger Hargeaves’ Mr. Greedy, from the Mr. Men series. They base that on sentence length, word length, and how difficult the words are. Rather than search my oh-so-extensive but badly catalogued library for my well-thumbed copy of Mr. Greedy and my long-ignored copy of The Grapes of Wrath, I’m going to rely on the passages the Guardian chose to compare. I read The Grapes of Wrath when I was in my mid-teens and I remember that passage. I was impressed with it and it flew about six inches over my head. The reason it stayed with me is that I knew it held some meaning I wasn’t getting. I did not read Mr. Greedy that year. It hadn’t been written yet, and my education was that much poorer because of it. A Renaissance spokesperson said that the company’s reading levels “are not the only measures of the suitability of a given book for a particular student.” And I’m sure that’s true, but damn it, Steinbeck won a Nobel Prize for his writing and I’m nominating Hargeaves for one. When Boris Johnson was London’s mayor, he was in love with the idea of building a garden footbridge across the Thames. That’s a bridge you can walk across that has stuff planted on it, turning it into a garden. Do I have to explain everything? Then Sadiq Khan became mayor and he drove a stake through the project’s heart. A charitable trust was set up to see the project through and it managed to spend £53.5 million, £43 million of which was public money, without having connected a single rivet to a single beam. And without, as far as I can tell, having bought either the rivet or the beam. Or whatever bridges are built out of these days. Spit and good wishes for all I know. Both of which are available for less than £43 million. I have a sizable store of them myself, and your’re welcome to bid on them. Where’d the money go? The designer, the engineer, multiple lawyers, executive salaries, a survey of the riverbed, and a search for unexploded World War II bombs. Unexploded bombs do still show up here and there, so don’t think I’m throwing that in to be funny. They’re awkward. And still dangerous. The project’s website alone cost £161,000. I also have a website. I haven’t added anything to it in a long time, but maybe I should go back and see what it would take to rack up that kind of a bill if I charge myself for my own labor. The largest chunk of money went to the contractor, who was paid for gearing up for the project and then for winding down from not having done anything in the middle. Or at least, nothing that I can find out about. The problem is, that doesn’t seem to be technically possible yet. Or so says Chris Dole from Drone Wars UK, which tracks the use of armed drones. The technology needed for something like that, he said, is “very much at the concept stage” and he didn’t see a way the deadline could be met. Gavin Williamson didn’t say that the drones had worked well in a comic book he read recently, but since we’re talking about things that don’t exist I don’t see any problem in quoting something the relevant person didn’t say. Later, he went on Twitter to say he’d been joking. Which may well be true, but you have to wonder if anyone’s shaken hands with him since. The bluestones at Stonehenge do exist, but archeologists have found the gaps they left behind when they were cut from a neolithic Welsh quarry. Make that two neolithic Welsh quarries. And eighty stones that were cut from them. The discovery points to two things: One, they were probably dragged to Wiltshire overland, not moved on waterways, and two, they might have been part of an earlier stone circle built closer to where they were quarried. Why overland? Because the stones came from further north than archeologists originally thought, making that the simpler route. And that bit about being used locally? There’s a gap of some 500 years between when the stones were quarried and when they were set up at Stonehenge. A local stone circle would explain what they were doing all that time. Unless, of course, eighty neolithic Welsh families used stones weighing roughly as much as a car (although that wouldn’t have been the point of comparison that came to their minds) as dining room tables, it’s the only thing that makes sense. Why were they moved? We’re not likely to ever know. Maybe the people who set them up moved and wanted to take their stone circle with them. Maybe they were taken in a raid. Either one is possible. Either one is also, when you think about the weight of the things and the work involved, ridiculous. But then so’s everything else I can think of. Stonehenge is the only neolithic stone monument whose stones–okay, some of whose stones–traveled more than ten miles from where they were quarried. Admittedly, Belfast isn’t the first place you’d look for chimpanzees, but the zoo has some and when a storm brought some branches down into their enclosure the chimps broke them up, made a ladder, and skedaddled up it and out into the wider world. Then they went back in. Because, with all due respect to Belfast, it’s not a chimpanzee-friendly city. And now something that does exist: a $16 million penthouse in Manhattan, recently bought by the British government to house the civil servant whose job is to negotiate trade deals if and when Brexit goes through. It has a 74-foot living area (it’s New York; they measure in feet there; I’ve had friends in New York whose entire apartment buildings, if they were flattened out, could fit into that space), five bedrooms (not one but two of which are master bedrooms), and two staff rooms. One of the staff rooms is only slightly larger than the minimum size for a British prison cell. Both staff rooms are smaller than one of the walk-in closet in one of the bedrooms. You’ll notice that staff rooms aren’t called bedrooms, although I’m going to be rash and guess that people are expected to sleep in them. They’re the places where certain people go to be staff. So it’s all good. We’re actually saving money on this. They did promise us that Brexit would save money.